You know who also gets stuff done last minute? Link! Well, at least he did in my game :D I swear, I lost so much time in the Fishing Hole, it's not even funny. 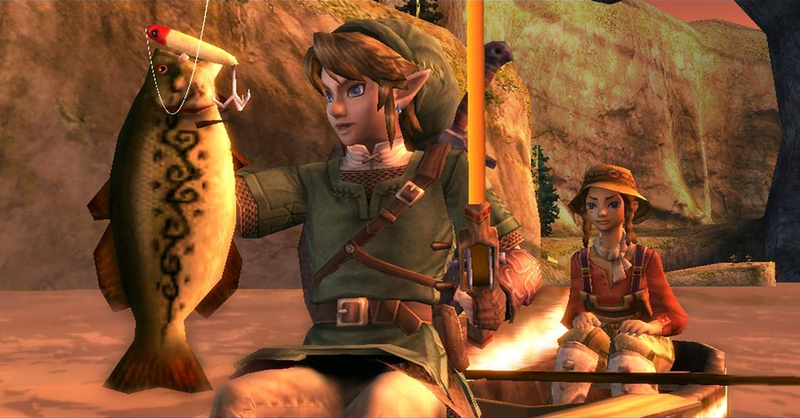 It's one of the reasons I loved Twilight Princess so much ^^ I just wish there were bodies of water nearby where I could fish in real life :I But, eh, the minigame is fun and does a good job at satisfying that need ^^ So what about you guys? What are your favorite minigames in stuff? And I'd really appreciate it if another admin bolded the above segment and provided links to the respective sites, and tag it with the tayclassic tag ^^; I sorta typed this on the mobile version, and have no idea how to do so. And I can't guarantee I'll be up early enough to do it myself, hehe ^^; Feel free to edit out this part if you fix it up. Thanks! Also, don't forget to check out the Kickstarter for A Hat in Time, in which our fellow commenter, Habboi, is an integral team member! If you can, please contribute! It looks absolutely amazing!